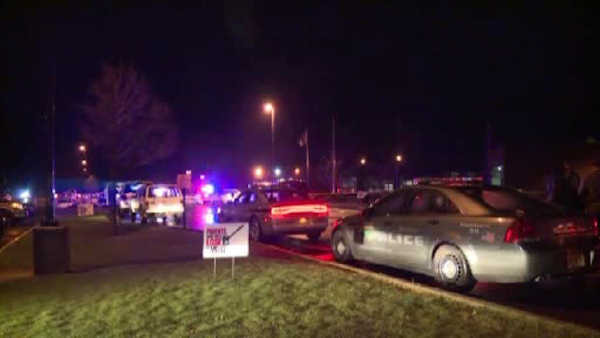 ANTIGO, Wis. -- An 18-year-old gunman opened fire outside of a high school prom in northern Wisconsin, wounding two students before a police officer who was in the parking lot fatally shot him, authorities said Sunday. The attack happened late Saturday outside the Antigo High School prom, said Eric Roller, the chief of police in Antigo, a community of about 8,000 people roughly 150 miles north of Milwaukee. Roller said the gunman - later identified as Jakob E. Wagner - shot the two students as they exited the building, though he didn't say whether investigators believe they were specifically targeted or discuss a possible motive for the attack. "Officers were in the parking lot patrolling the activities and heard the shots and an officer immediately fired upon the shooter, stopping the threat," he said. He said the gunman was then taken into custody. The Unified School District of Antigo said Wagner had approached the school with a high-powered rifle and a large ammunition clip. The district said in a statement that "quick actions" taken by police and district staff to secure the building "prevented what might have otherwise been a disaster of unimaginable proportions, and we are extremely grateful for their well-rehearsed response." The female victim was treated and released and the male victim was undergoing surgery for injuries that weren't life-threatening, police said. After the attack, students were escorted from the prom to safety and the victims' families were notified.